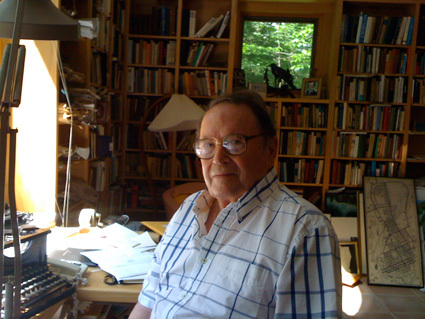 Richard Wilbur in his study in Cummington, Massachusetts. Photo by Arlo Haskell. Richard Wilbur’s auspicious 1947 debut, The Beautiful Changes, earned the admiration of two of the most enduring American poets of the era, Robert Frost and Wallace Stevens. By the late 1950s, Wilbur had completed a landmark translation of Molière’s The Misanthrope, and received the Pulitzer Prize for his third collection of poetry, Things of This World. Since then, Wilbur has received nearly every award and honor available to an American poet, including two Pulitzers, two Bollingen Prizes, a National Book Award, and the office of the U.S. Poet Laureate. His definitive translations of Molière, Jean Racine, and Pierre Corneille represent nearly the complete output of these major figures of 17th-century French drama, and he has translated poetry by an astounding range of poets including the Portuguese Vinícius de Moraes, the Russian Anna Akhmatova, and the Argentine Jorge Luis Borges. For parts of five decades, Wilbur and his wife Charlee spent winters in Key West. Here they became part of a cadre that included John Ciardi, the noted translator of Dante’s Inferno, Pulitzer Prize-winning World War II correspondent John Hersey, two-time National Book Award-winning poet James Merrill, and poet, biographer, and social critic John Malcolm Brinnin. Our interview began in February as a series of exchanges through the mail. On a sunny day in late August, I drove to visit Wilbur at his home in the Berkshires outside Northampton, Massachusetts. We had a lunch of turkey sandwiches with beets from Wilbur’s garden and walked from the house to his study, an open structure with large windows and wall-to-wall bookshelves. On the windowsill is a pair of binoculars, and in front of the window is Wilbur’s desk, topped with an early 20th-century L.C. Smith typewriter and the blue folder containing the manuscript that will become Wilbur’s next book of poems, due in the fall of 2010. 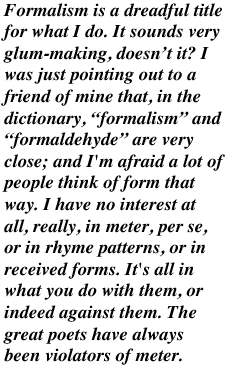 Our conversation—about Frost, Stevens, Key West, Wilbur’s practice, and his place in the republic of letters—follows. Littoral: You knew both Wallace Stevens and Robert Frost early in your career. How did you come to know them, and what was their influence on your work and career? Richard Wilbur: When I went to Harvard Graduate School on the G.I. Bill after World War II, Frost was spending much of the winters in Cambridge, and my wife and I soon got to know him. He was kindly disposed toward Charlee because her great-aunt, Susan Hayes Ward, had encouraged him when he was obscure, and was always called by him “the first friend of my poetry.” He took to me also, because I had many of his poems by heart, and when my first book appeared in 1947 he spoke kindly of it. We saw Robert– as he soon let us call him– frequently thereafter in Cambridge or in Ripton, Vermont, or at our house in Portland, Connecticut, once I’d begun to teach at Wesleyan. His poems always seemed to me to be a wonder and an inimitable model: I had no wish to ape his work, but it made me seek for a speaking voice, for meter and rhyme which worked as if by accident and for plain situations having overtones. In Stevens’s work I was delighted by the gaiety of his flow of thought. I saw him rather rarely, but he was good to me and backed me for a Guggenheim in 1952; and I once had the honor of introducing him to a capacity crowd in Harvard’s New Lecture Hall. His ability to combine “the imagination’s Latin with the lingua franca et jocundissima” (as Stevens writes in “Notes Toward a Supreme Fiction”) was something I sought after in my own way, and with gratitude for his infectious example. L: Like Stevens and Frost, you ended up in Key West. What first attracted you to the place? Were you aware of their histories in the town? 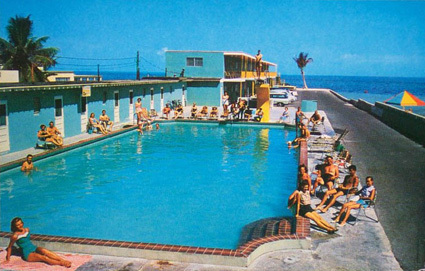 The Sun ‘n’ Surf Motel, Key West, circa 1960s, where the Wilburs first stayed. Later we bought a one-room apartment on Elizabeth Street, and then with some writer friends– John and Barbara Hersey, the Ciardis– we bought into a compound on Windsor Lane, to which we returned for as much as three months of every year until 2005, when my wife fell ill. We enjoyed the company of many good friends, and I always loved simply being able to wear shorts, to ride my bicycle, and to play tennis on the city courts in the middle of winter. I found the variety of Key West life very conducive to my work. It has some of the virtues of a city– there’s always been a kind of art colony there in flux, and by now it has its own symphony orchestra, productions of plays– and then there are the boats, the fishing, that kind of thing. There’s more of a cocktail society than is good for us, of course, but all you have to do is not attend all the parties. You can live in Key West in all kinds of ways. When we went down to Key West originally, I had no recollection that there was any connection with Frost. He wasn’t much of a hotel dweller, whereas Stevens was practically designed to be a patron of the Casa Marina, that great old hotel on the ocean where he stayed. L: Were you among the Anagrams players in Key West? RW: Yes, I’ve played a lot of Anagrams. I was introduced to it as a child, but I wasn’t an incessant player until I began playing in Key West with people like John Malcolm Brinnin and John Ciardi– a devoted and violent Anagrams player. There’s a long list of people who became devoted to the game: Jimmy Merrill played a little with us, Harry Mathews, Rust Hills, Irving Weinman, and each of the players took turns hosting the weekly game. John Hersey played– he knew all the names of all the fish in the sea, and he was very good at any word connected with boats and fishing– and after a certain amount of exposure to the game John wrote a story about it, published in Key West Tales. We tried to keep it a high-minded, good-tempered game. There were no wagers, but we did begin to have certain rules that were above and beyond the rules of the game itself. It was understood, for instance, that you would not have any Bass Ale, which came to be the official ale of these games, until the first of two rounds was over. L: What was your reaction to being named U.S. Poet Laureate in 1987? L: What are you reading these days? RW: I’ve been reading Elizabeth Bishop and Robert Lowell and other poets of that period– which is to say my period– because I’m in the funny position of being about to teach my contemporaries at Amherst this fall, with my old friend David Sofield. We’ll co-teach the course, beginning with W.H. Auden, and proceeding through Bishop, Lowell, Randall Jarrell, John Berryman, Sylvia Plath. It’s going to be difficult for me to turn myself into a considering, evaluative teacher of the works of people I knew so well, so personally. And I shall have to try hard to avoid being an old anecdotalist, telling stories on my old friends and acquaintances. L: Are you writing poetry now? I almost always have some translation project going to keep me busy in between visits from the muse, but at the moment I don’t. There’s no use looking at Molière anymore; I’ve done all of his verse plays that I’ll ever do. The only one I haven’t done is a lemon, and I don’t want to try it. I just published with Houghton Mifflin / Harcourt two new translations of Corneille’s plays, “The Cid” and “The Liar,” and I’ve been considering other plays by Corneille and a couple of possibilities from Racine. It is good to have something honorable to toil at when you’ve not been visited by an inspiration. As embarrassing as that word is– “inspiration”– I do think it corresponds to my experience. A poem comes looking for me rather than I hunting after it. L: Do you prepare yourself for these visits? Do you sit at the desk and wait? RW: It just happens when I’m walking about. I just go about my business. Of course some of the time I’m reading other people, and the impulse can come of reading a good poem of Robert Frost’s and thinking “I wish I could do something like that.” Every poet, I think, has some other poets in his experience who are, as John Holmes used to call it, their “starters.” Holmes said when he read Robert Graves it made him want to write his own poems. I think I feel that way for example about Elizabeth Bishop. Reading her makes me want to have the great pleasure of writing a poem. L: And you still enjoy reading Frost and Bishop after a lifetime? RW: Oh, I shall never tire of reading them. L: Does your personal relationship with them inform your sense of their work? RW: It’s bound to. When I read Bishop’s poems, I hear her voice. Hers was not a performer’s voice at all, and she considered herself a bad and unpersuasive reader of her own poems. But when she read her poems, she read them in the authentic voice that they had, and so I find it good not only to read her, but to hear her again. L: Do you feel that your work is part of a tradition? RW: Well I know that in some of my poems I’m a continuator of Robert Frost, and I hope that I belong somewhere in the same ballpark. I think that poets who are worth a damn are in communion, as it were, with a great part of the poetry that’s been written in our language and in others. That’s what I think is meant by “the republic of letters.” If you’re a serious poet, you may be a member of the congress in the republic of letters, not debating, but discussing. And in the poems I like best, there is– often by the subtlest signs– that discussing of things with other poets of the past. If you look at Stevens’s “Le Monocle de Mon Oncle,” for example, you find him conversing with John Keats. And in Frost’s famous poem, “Birches,” he’s talking with Percy Bysse Shelley about “Adonais,” Shelley’s elegy for Keats. Frost describes the effect of ice storms on birch trees and how the ice is shaken off the trunks of the birch trees. When he says “such heaps of broken glass to sweep away, / you’d think the inner dome of heaven had fallen,” it’s clearly a reference to Shelley’s “life, like a dome of many-colored glass / stains the white radiance of eternity,” and it begins a discussion about whether a kind of unlimited spiritual aspiration is the true nature of poetry. Frost says it’s not; he says “earth’s the right place for love.” His poem is about the importance of going toward heaven and then coming down to earth again. It’s not about unlimited aspiration to the heavenly. L: Your poetry, too, is grounded in the real, physical world. RW: Well I hope it is. I was just writing a letter to a friend this morning and remembering how Aristotle says that the essential poetic gift is for metaphor. And if that’s the essential poetic gift, then a kind of impatient abstraction that rises above this world and its things is not the essential poetic move. Poetry is concerned with things, and with making them vivid, and what metaphor does is to render some part of the world more vivid by comparing it– sometimes violently– to something else. That’s certainly what happens in the riddle, which Aristotle describes as “dark metaphor.” You go into it a little puzzled, but when you come out it’s like you’ve come to. You say “Ah-ha! This is that.” Of course you don’t in a literal way believe this is that, but it makes the thing under consideration far more solid and it gives you a more intense and surprised perception of the interlaced objective world, of things as they are. L: Critics always point out that you write in established poetic forms, unlike many of your contemporaries. Does that attention to the surface of your work seem appropriate? RW: Well it’s true. It simply is true that I have only written and published one free verse poem in my life. However, it seems to me that formalism is a dreadful title for what I do. It sounds very glum-making, doesn’t it? I was just pointing out to a friend of mine that, in the dictionary, “formalism” and “formaldehyde” are very close; and I’m afraid a lot of people think of form that way. I have no interest at all, really, in meter, per se, or in rhyme patterns, or in received forms. It’s all in what you do with them, or indeed against them. The great poets have always been violators of meter. A sonnet of John Milton’s is likely to overrun the pattern at every point; something like his “On the Late Massacre in Piedmont” scarcely has anything in it which one could regard as formally tidy. It overruns the quatrain divisions and rips into the rhyme scheme with an appropriate violence. And I have the same attitude toward form. I think what you do with meter is not obey it but violate it. L: At our 2003 Seminar, you read “Lying” and called it both one of your best and one of your most difficult-to-understand poems. Would you agree with Stevens that poetry should “make the visible a little hard to see”? RW: The main thing that “Lying” has to say is that we can’t create another reality, because all things are inevitably part of the “cognate splendor” of the original creation and its development. The busy-ness of the poem (Ralph Ellison once told me “Man, you are riffing in this one.”) consists of one metaphorical proof after another that all things are of one nature. I don’t think that, in Stevens’s phrase, my poem “makes the visible a little hard to see”: the likening of onion skin to sail, for instance, is meant to be vivid. If my wife’s first reaction to “Lying” was “at last you’ve written a poem that’s unintelligible from beginning to end,” she soon came to see that the poem is a bombardment of proofs that the world is one. L: Your poems maintain such good will. Are you an optimist by nature? RW: If an optimist is somebody who thinks everything will come out all right, I’m not. But, if it’s optimistic to think that the world is fundamentally a great wonder and a great order, yes, I subscribe to those things. • Listen to two recordings of Wilbur in the KWLS Audio Archives: a reading in tribute to Elizabeth Bishop in 1993, and a 2003 reading from his collected works. • Wilbur will be our guest of honor at the 28th annual Key West Literary Seminar, January 7-14, 2010. RW’s work – what little I know – is beautifully written. Sometimes reminds me of Updike in its voices and cadences.. “Lying” is stunning poem. Splendid to see RW is still going strong. Nice little interview. I love that line in “Mind” about the “graceful error”. Classy. I read “Love Calls Us” as often as I can, and dip into the 1989 Collected perhaps less often, but still enjoy the immersion of some several hours. The Winter Deepening is another (brief) favourite. Marvellous poetry, and proof that “formalism” is far from exhausted, should a practitioner lean in that direction. Wonderful interview, wonderful artist and human being. I’ve been a big fan since undergrad days in the ’60s. Have often, often wanted to sit down and talk with Richard Wilbur myself, bounce a couple of my own silly thoughts off his great mind and see what comes back. I think he is one of the all-time great poets of the English language. It says something that nearly every time I read his poem “Clearness,” tears come to my eyes at the last line. Came to this interview late, as I began studying Wilbur’s work as inspiration for my own poetry. The “Key West C0nnection” is part of what drew me. We’ve been to Key West and will spend another month on Sanibel this February, where I’ll watch the Gulf, compose poems, do some watercolors, and think of all the fine poets who made their way to the Keys, the foreskin of the foreskin of the continent.